Still our favourite phaser. Still brings us back again and again. See below for new demos of the actual unit for sale. Serviced and in excellent working order. Has more grit and drive than many of these we’ve had – hear it for yourself in the demos below. Cosmetic condition is good – some dings to the edges of the casing and other minor signs of age. We can supply a custom dual footswitch which unlocks all the control/switching options. It’s not included and the unit will work without as we supply a blanked off plug to go into the socket. Available separately via this link – see below for a demo and picture. It’s a UK/EU 240v model, but can be jumpered internally to operate at 110v – otherwise a step-up transformer can be used – we do not recommend using cheap generic Chinese mains transformers and can supply high quality UK-made transformers if required. Two demos below of the actual unit for sale – the second shows the custom controller in action as well. 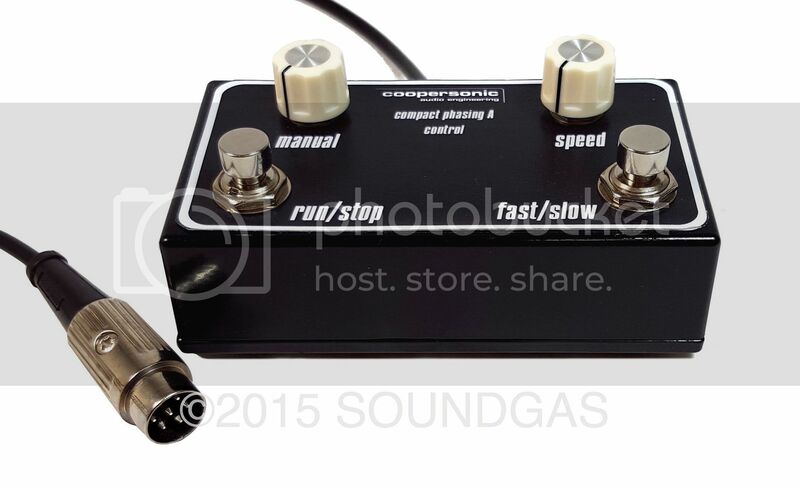 Below is one of the custom control footswitches made exclusively for us by Coopersonic (not included in sale – available separately). It has two footswitches for LFO start/stop and fast/slow speed selection, and twin rotary pots for the manual control (centre frequency) and fast speed setting. It allows access to the full functionality of the Compact Phasing and is highly-recommended.